We woke behind Cape Flattery to a weather forecast telling us to expect 30 knot winds again in the evening and all of the next day. We could have stayed there, but it was pretty dull and not very well insulated from the swell. Lizard Island beckoned from less than 20 miles away, giving us ample time to get there and hide before the blow started again. When we poked our nose out from behind Cape Flattery, we found a reasonable 20-25 knots which took us to Lizard in no time at all. 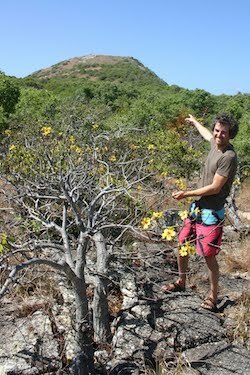 We’d heard good reports of the island and were keen to stay for a while to explore. When we arrived at the Mrs Watsons Bay anchorage, we were a little surprised to find more than a dozen cruising boats packed in among the coral heads, as well as a fair sized but inconspicuous resort on the shore. The bay is named after the eponymous wife of a beche-de-mere fisherman who was attacked there by aboriginals while her husband was out fishing. She and a servant and her newborn child escaped to sea in a cast iron boiling tub, and eventually washed up on what is now called Watson Island, where all three of them perished. The water was blue and crystal clear; we could actually see the anchor on the bottom. The island gave good protection from the developing swell, but very little from the actual wind, so we put out all 70 metres of chain in preparation for the night ahead. It did indeed blow that night, 30 knots or more, and all the boats got a good thrashing. I kept being awoken by strange sounds that had me running up on deck, but the anchor held. We were a bit tired the next morning, and simply stayed below all day as the wind continued to howl. The next night was a little calmer, and by lunchtime the waves had died down enough that we were finally able to lower to outboard into the tender and go ashore. 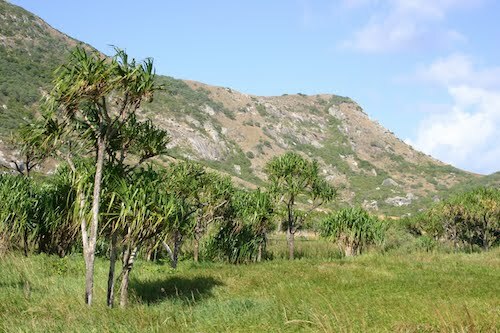 We found a trail leading across the island and through the Pandanus swamps that fill the level ground between the rocky hills. The trail led to the ‘Blue Lagoon’, an unusual geological formation in that coral lagoons are usually features of reef rather than of continental islands. In the case of Lizard Island it also provides yacht anchorage in calm weather, but those conditions certainly didn’t apply today and nobody had tried it. There were, however, a few kite-surfers playing around, having sailed around the island from the resort. 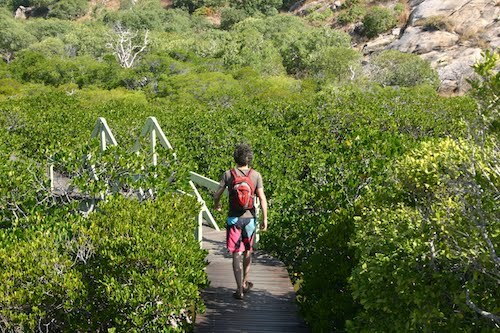 Lizard Island is also famous for having a peak that was climbed by Captain Cook when he was trying to find a vantage point from which he could plan a way out of the Great Barrier Reef. We set off on his trail on the following morning. It was a pleasant clamber over enormous granite boulders, shaded here and there by gums, and the views down into the reefs of Mrs Watsons Bay were spectacular. From the top of the hill, we could faintly make out in the distance the dark blue of lurking ribbon reef, and the lighter blue of safe passages. If Cook hadn’t successfully spotted the gap, then he might not have made it back to England and Australians today might all be speaking French. It was very satisfying to stand there on a hilltop on an island in the far Great Barrier Reef, staring out to sea and feeling the connection to the history of our adopted country. Bien sûr. Back at shore level, we went for a welcome swim in the gloriously clear water, and used the coral sand to scrub away the weeks of sun tan lotion and grime before returning to Pindimara for a rare and welcome freshwater shower. We’ll definitely be coming back to Lizard Island again. It has genuinely beautiful white coral beaches, a very pretty landscape, some serious rocks, and a warm and easily accessible reef. Wonderful. But now, it’s time to move on. The Torres Strait beckons. This entry was posted in Australia, Oceania, Travel, Voyage of Pindimara and tagged Great Barrier Reef, Sail on 2009/08/20 by Reinhard.